Environmentalists continue to voice their concern and misgivings over plans to divert part of the Argichi, the largest river flowing into Lake Sevan, towards a central Armenian province with its eventual flow into the Caspian Sea. The move, they say, is aimed at achieving the reduction of the level of Sevan, the country’s largest body of fresh water, whose rising waters in recent years have affected some lucrative businesses along the shore. Meanwhile the increase in this level observed recently is considered to be a major environmental target for the country where Lake Sevan is central to the entire eco system. The government, which has repeatedly declared its commitment to the environmental goal of raising the lake’s level, says it will make sure the issues raised by environmentalists are dealt with properly. Argichi is the largest of 28 rivers that flow into Lake Sevan. It accounts for an estimated 12 centimeters of the lake’s waters and is used for irrigation purposes by about 30,000 residents in the six nearby villages. 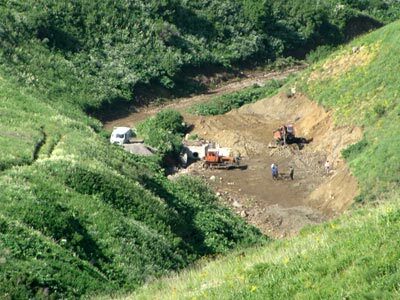 If the plans to change the bed of the stream that flows into the Argichi, Galyadzor, are realized, some water will be redirected towards Vayots Dzor in central Armenia, which is on the opposite side of Lake Sevan. Environmentalists say the Law on Lake Sevan which prohibits the use of the lake’s basin water for other purposes, be it a hydro-power plant, irrigation or some other purpose, is being violated. Besides, it is also dangerous for fish, especially trout, since they spawn at the source of this very river. “They say that they want to take water for irrigation purposes, but judging from what we have seen ourselves, from the construction that has already been done, the holes that have been dug on an area of 1.5 kilometers and the construction of two bulwarks, which means that they are building a hydro-power plant for their profits and not for irrigation purposes,” says Lianna Asoyan, an employee of the Aarhus Center in Armenia’s Gegharkunik province. Aarhus, named after the Danish city where in 1998 a well-known United Nations convention was signed to facilitate “access to information, public participation in decision-making and access to justice in environmental matters”, is an international organization that has centers in different countries, including Armenia. Verin Getashen village resident Vardan Galstyan says he is also puzzled at how the water will be used for irrigation through canals at an inclination of 60-80 degrees (as irrigation cannot be done at that inclination and requires a lower one), which, he says, reveals plans to build a hydro-power plant. “I use only this water to irrigate my 2,300-square-meters land from which I get 15 tons of potatoes and cabbage for my 13-member family’s needs. Now if they cut this water off, what will I feed my family with?,” says angry resident Paytsar Aghababyan, 57. Workers at the Gegharkunik regional governor’s office insist they do not know the initiator of the construction project and qualify it illegal because they say they did not issue relevant permission. And head of the territorial division of the environmental inspectorate of the Ministry of Nature Protection Soghomon Soghomonyan says that the governor’s office has always been aware of it, as still from 2006 to November 2009 there was permission for using that water for irrigation purposes. “But we will do everything for that construction not to continue,” Soghomonyan assured ArmeniaNow. During the past year the level of Lake Sevan level has risen by more than 50 centimeters -- to 1,900 m and 3 cm, completely flooding the nearby roadway as well as submerging hundreds of illegal constructions. Experts estimate the Sevan must reach the level of at least 1,905 meters to avoid further evaporation and swamping.